The roots of Audiotricz are simple: two guys and one ambition that turned the dream of Leon and Kenneth, a.k.a. Audiotricz, into a daily reality. With perseverance as their secret weapon and an infinite passion for music, they’ve been on a non-stop ride to the top! The Audiotricz-story started in the beginning of 2013. Now, only a year later, they have already produced hardstyle anthems that have topped charts around the world. In addition to these tracks, they’ve also collaborated with world-renown artists in the dance music arena. 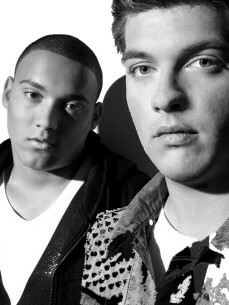 Drawing on their background in sound design, Leon and Kenneth have created a truly unique sound that has garnered instant support from artists like Noisecontrollers, W&W, Headhunterz, Brennan Heart and many others. They’d describe their signature as energetic, euphoric hardstyle with a raw edge; in other words, the perfect ingredients to fire up any party. With hits like “Momentum” with John Harris, “Infinite”, and their remix of Fedde Le Grand & Nicky Romero’s “Sparks,” they’ve made their musical statement in the hardstyle scene. Factor in a fully-loaded calendar and an ever-expanding fan base, nothing can stop Audiotricz from becoming true hardstyle icons. They’ve already performed at festivals like Q-Base, Emporium, Intents Festival and Daydream Festival, and events such as X-Qlusive Holland and Mondaybar Sweden, but there is a lot more to come.